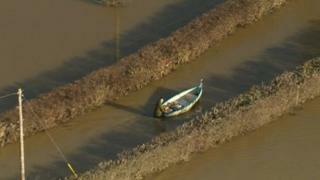 Four people had to be rescued from a car when it became trapped in floodwater in East Sussex. The vehicle was caught in about three feet of rising water for 90 minutes in Barcombe Mills Road, near Pike Bridge, Barcombe, on Thursday night. Crews from East Sussex Fire and Rescue Service used boats to help free the stranded occupants. Environment Agency staff worked overnight to prevent the risk of flooding following Thursday's rain. The landlord of the Anchor Inn in Barcombe Lane, Barcombe, used a boat to take in supplies on Friday after the River Ouse burst its banks. The pub was surrounded by water and a delivery van was unable to get its beer delivery to the door. Flood warnings remains in place at Cuckmere River and Bull River in the Hailsham area of East Sussex. The Environment Agency said it expected water levels to fall as no rain was forecast until Saturday.